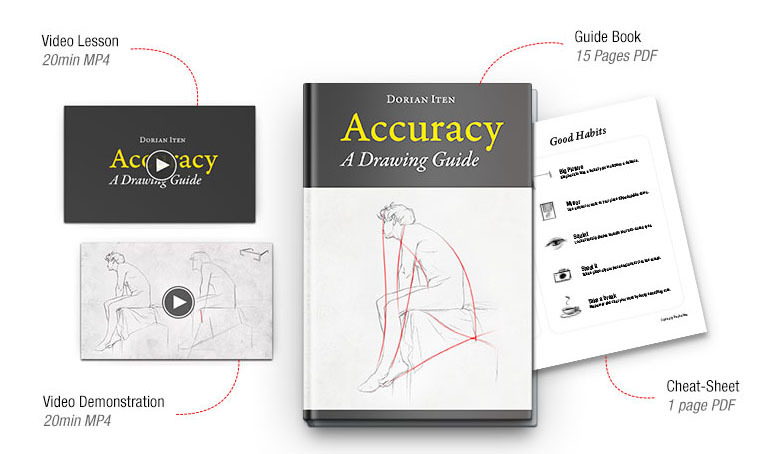 Swiss artist and teacher Dorian Iten, who has studied in some of the best ateliers in the USA and Europe, is now offering a teaching package that concentrates on how to achieve accuracy in your drawings. The teaching rubric of "Accuracy: A Drawing Guide" begins on familiar ground. 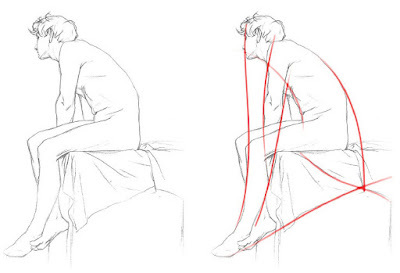 He takes a line drawing of a figure on the left, and reproduces it on the right. 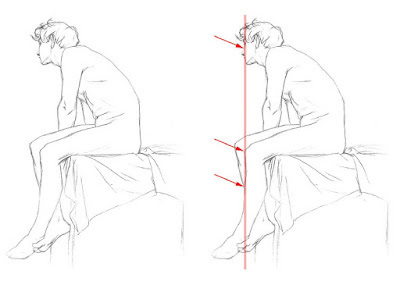 The drawing on the right shows alignments along a vertical line. 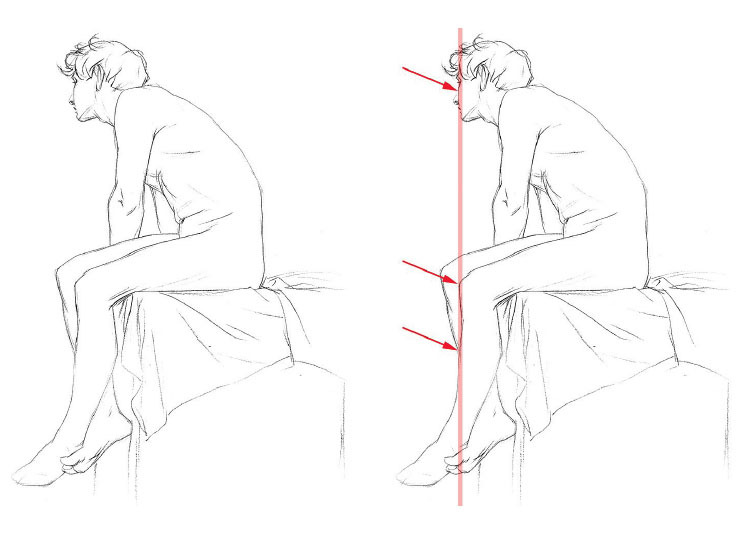 Checking alignments is just one way evaluating a drawing for accuracy. There are four others, and he has concretized these modes of seeing by proposing five kinds of glasses. Each pair of glasses represents a different way of checking. Clockwise from upper left, there are the Alignment glasses, Angle glasses, Measurement glasses, "Creaturizing" glasses, and Implied Line glasses. These are all methods used for 2D copying of static subjects; they don't really help you deal with moving subjects, and they're not about constructing forms in space. 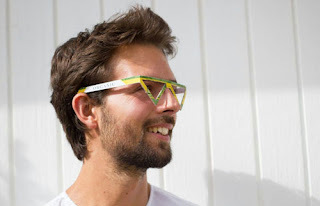 Here's what you look for with the Implied line glasses on. 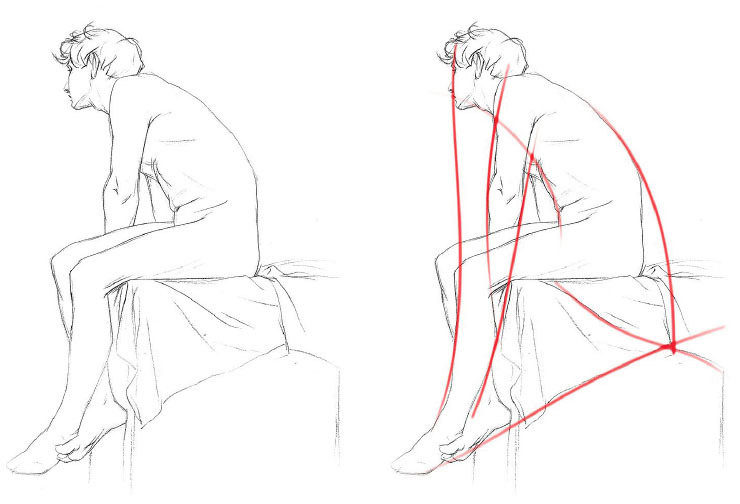 The simplified contours seem to extend beyond the small forms and pick up again in other parts of the pose. To Dorian, these glasses are more than just a metaphor. He actually has his students cut them out of cardboard (but you don't really have to). Here's Dorian wearing the angle glasses. Very stylish. The entire teaching package includes two videos, a PDF guidebook, and a cheat sheet that thoroughly discuss this clever approach. • If there is a sacrifice of profit in order to reach more people (which there might not be), I'm willing to make it at this point in my journey"
If you are interested, you can download the packet for what it is worth to you: a cup of coffee, a magazine, or a day-long seminar. Hi James. As usual there're always useful tips in your blog. 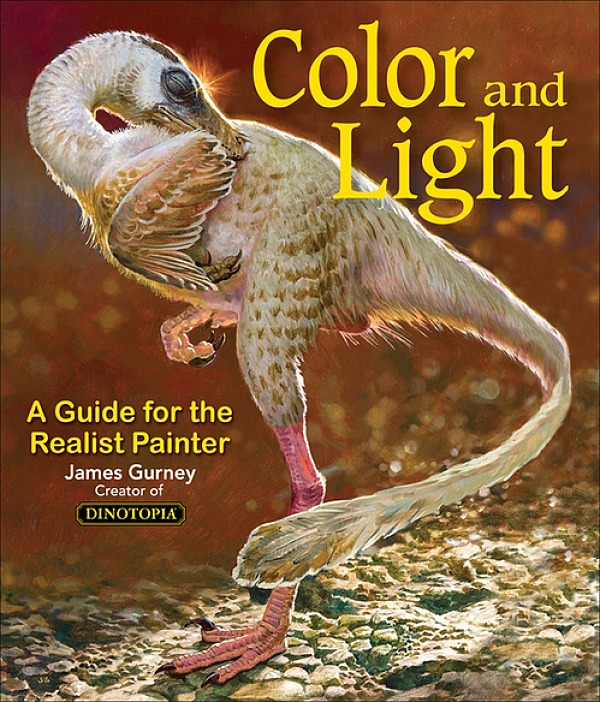 I'll definitely check this guide on proportions. I'm currently struggling with an assignment doing a series of portraitures from photos (no live models sadly) of celebrities. I wonder if you can recommend any articles or even share some impressions of your own on how to capture likenesses. Cheers. Sounds great! I've spent a couple of hours today trying to figure out the best way to explain such things to students. And how to make better tutorials than what you find online. 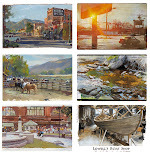 My aim is to do a video tutorial for portraits as well as teaching live. That might be a while though! Sounds wonderful, but you don't go quite so far as rating it. The best rating system for this seems like... On a scale of awful to many $, how much would (or did) you pay for it? "These are all methods used for 2D copying of static subjects; they don't really help you deal with moving subjects, and they're not about constructing forms in space." Do you work with any particular method, or set of methods, that helps you deal with objects in motion? Clyde, I don't usually give a rating because I only review things I implicitly recommend. I think a review is most valuable when it describes something in such a way that the value of the thing is evident to the person reading the review, even if that value may vary widely from person to person. I hope that makes sense. Glenn, yes, I can only describe the experience as something like managed panic, fueled by unreasonable faith. When I'm sketching something moving, I try to REMEMBER what I've just seen, IMAGINE what I know about the construction of the object, and OBSERVE what I can in the moments that the thing goes back to position. Sunila, it's interesting to see how Dorian has used his skills both with CG and with traditional drawing, to make an instructional video. Carlos, I'd suggest putting the word "likeness" or "caricature" into the blog's search box, or clicking on the tab for Portraits. As for videos, Drew Struzan's video on the Hellboy poster is excellent teaching from a master of celebrity likenesses. 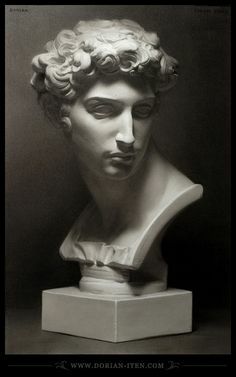 Hi James, would these methods help with portraits or still lifes ( like with the underdrawing and such)? Preapprove future payments made from your PayPal account." This does not sound right, so I did not go through with it. I had the same message Alex had but went through with it. The window displaying the message was from PayPal and a lot of artists use gumroad so it is safe. Then you won’t have to login to PayPal again in order to make this purchase. You would just have to click “buy” and be done with it. Kind of like being logged into Amazon – you don’t enter your payment info on there every time you buy things – the information is just saved." I was concerned about that pre-approving future payments too, so I paid with a credit card instead of paypal. Easy solution.